Agency Power now has a wide variety of steel braided brake lines for most high-end performance cars. The brake line kits are made in the USA to meet strict D.O.T. certifications. The steel braided lines are a smoke color with the AP logo printed on it. The CNC machined fittings are in classic Agency Power Gold to separate you from the competition. All kits are assembled for a quick and easy install. Includes fittings, hoses, and necessary hardware. Steel Braided lines improve component performance over the stock rubber hose. With rubber hose, the fluid under pressure flexes the hose, causes loss in firmness and reaction. With the steel braided lines, the response is firmer giving you more control. 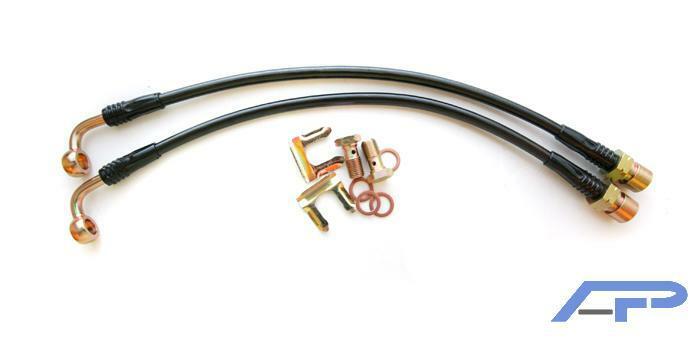 Brake lines are sold as pairs, front or rear. See item description. Some applications may take up to 1 week for delivery. Special applications available upon request. Ordered Monday, delivered Thursday - just as promised. Best price among all reputable on-line parts dealers. Saved at least a third off the most popular dealers. My order for a "Thule" bike rack went thru like silk. Was received (1) day early. Would recommend "Autoplicity" to anyone. Best buy I could find on line. Super easy + best price on the web. Very pleased am I.